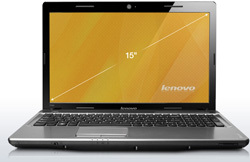 Lenovo Laptop with Dolby Audio for a Back-to-school Giveaway! Congratulations to Hope W. on winning the Lenovo laptop with Dolby Advanced Audio! We hope this helps with your college studies! Sign-up for our FREE weekly Techlicious email—be sure to provide a valid email address when you sign-up (the same one used for your comment) so we can contact you if you win. Already a subscriber? Skip to step 2! Once you have subscribed, tell us in a comment below "How would better audio on your PC improve your life?" See Official Rules below for more detail. The Lenovo IdeaPad Z560 laptop (MSRP $849) uses Dolby Advanced Audio technology to provide great sound for your dorm room or home office. And Dolby is giving away this great laptop to one of our email subscribers! PCs have never been known for delivering a great audio experience. Yet, Dolby Advanced Audio changes all that, restoring the realism of the original soundtrack, whether for movies, music or games. So you experience every detail exactly as it was intended to sound. How does Dolby do it? Dolby Headphone enables a great surround sound experience and works with any set of headphones, putting the user in the middle of the action. Natural Bass and High Frequency Enhancer delivers sound that's more realistic and more dramatic than ever before. According to research released today by Dolby, approximately 60 percent of surveyed college students are now using their PCs more than televisions for entertainment. In fact, the majority of students believe PCs deliver the best overall entertainment experience and, as a result, expect higher-quality audio. In addition, 64 percent watch entertainment on their computers with others, so great audio is critical when considering a back-to-school laptop! The Lenovo IdeaPad Z560 includes an Intel Core i3 Processor, Intel HD Graphics, 15.6" HD Display, 3 GB Memory and a 500GB Hard Drive. We will randomly select one (1) winner from the entries. No purchase is necessary to win. Maximum of one entry per person. The giveaway will end at 11:59pm on August 31st, 2010. Void where prohibited. U.S. residents only. Click here for the full rules. I’d be able to watch TV and movies on my PC and actually enjoy the sound! I’ve got three daughters ages 1, 2, and 3. I can’t hear anything with all the crying, talking, babbling, laughter, etc. in my house. Improved audio on my computer would definitely help! I’d get better sound from the movies I like to watch. Thanks for the contest. I live with the shame of having no speakers on my computer! I DO have a set of headphones so I can hear things, but generally….all my computing is done in (gasp) silence. Improved audio would be….amazing! I use my computer for entertainment, listening tio music, watching movies, and taking classes online. better audio would be great to have.